DHEA production peaks in your mid-20s. In most people, production gradually declines with age. Since DHEA levels decline with age, some researchers speculate that supplementing your body's falling levels of the hormone might help fight aging. And some small studies have reported positive anti-aging effects from the use of DHEA supplements. But a similar number of studies have reported no effect. According to the Natural Medicines Comprehensive Data Base, DHEA supplements do not seem to affect the aging process. Also, little is known about the effect of long-term use of DHEA. And there is some concern that continued use of DHEA supplements could be harmful. In a small, six-week study, researchers from the National Institute of Mental Health found that treatment with DHEA supplements helped relieve mild to moderate depression that occurs in some middle-aged people. DHEA may also be effective for improving aging skin in the elderly. Some of these side effects can result from DHEA raising the level of testosterone and estrogen in a person's body. Medical experts caution that little is known about the long-term effect of the elevated hormone levels. DHEA supplements should not be taken long-term without consulting with a health care professional. Unfortunately, most of the studies that have been done have shown little effect from DHEA in losing weight or increasing metabolism. It's a good idea to talk with your doctor or a nutritionist before investing in a DHEA supplement for weight loss. DHEA supplements are sometimes used by athletes because of a claim that it can improve muscle strength and enhance athletic performance. That's because DHEA is a "prohormone" -- a substance that can increase the level of steroid hormones such as testosterone. There is little evidence to show that DHEA has any effect on enhancing muscle strength. Its use is banned by sports organizations such as the National Football League, Major League Baseball, and the National Collegiate Athletic Association. Aggressive behavior, known as "roid rage"
Use of DHEA carries some risk and can cause a range of side effects, though this usually just occurs at the higher end of the dose range. National Institute on Aging: "Can We Prevent Aging?" National Center for Complementary and Alternative Medicine: "Menopausal Symptoms and Complementary Health Practices." Vanderbilt University Psychology Department: "DHEA." 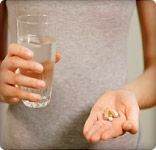 The Hormone Foundation: "Supplements, Steroid Precursors, and Adolescent Health."